It’s tomato season! If you’re growing heirloom varieties, don’t forget to save some seeds from your harvest for next year. If you’re growing heirloom tomatoes, a great way to preserve these precious varieties for the future is to save your own seeds. Heirloom tomatoes are unique, tasty varieties that have been passed down through the generations with specific characteristics, such as a certain color, flavor, or shape, instead of being hybridized for uniformity, as are most of those you find in the supermarket. Unlike hybrid seeds, heirloom seeds can be saved and grown year after year with the same results. Saving your own tomato seeds for next season is pretty easy to do, and the article below shows you how. To save tomato seeds you’ll want to avoid hybrids, which won’t reproduce true from saved seeds. To ensure purity, choose an heirloom variety that’s planted at least 10 feet away from other varieties. Ideally, you’d choose similarly sized and shaped fruits from more than one plant (preferably six or more); this helps preserve genetic diversity. 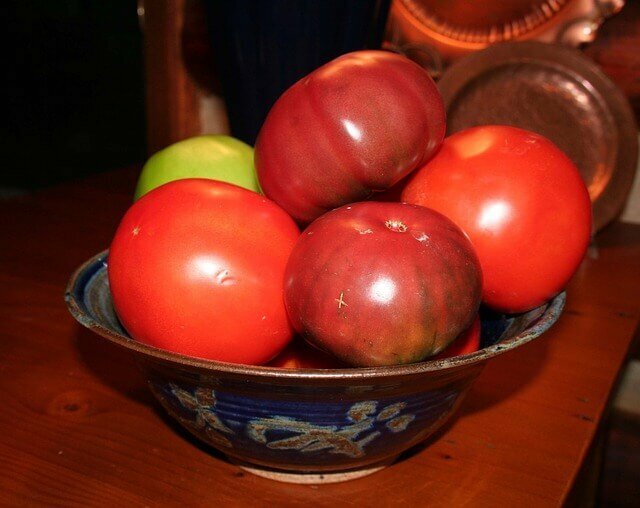 The tomatoes should be fully ripe at harvest and free of disease. If you’re concerned about the latter, dip fruits into a bleach solution (10 percent bleach; 90 percent water) and rinse before proceeding. You can expect to get 50 to 100 seeds from each medium-size fruit, and the seeds will be viable for at least five years, so it makes sense to save more rather than less. If you plan to save seed from more than one variety, be sure to label seeds clearly throughout the process. For detailed instructions see the full article at ModernFarmer.com.